Peel angle: Settable at 30, 45, 60, 90, 120, 135 or 150 degrees. Fitting: Type Om (12 mm connection with 6 mm clevis pin). Maximum operating temperature : 60°C (140°F). The miniature variable angle peel fixture is designed for determining the bond and peel strength of microelectronics components like copper runners, films, tapes etc. when peeled from circuit board, substrates or components. 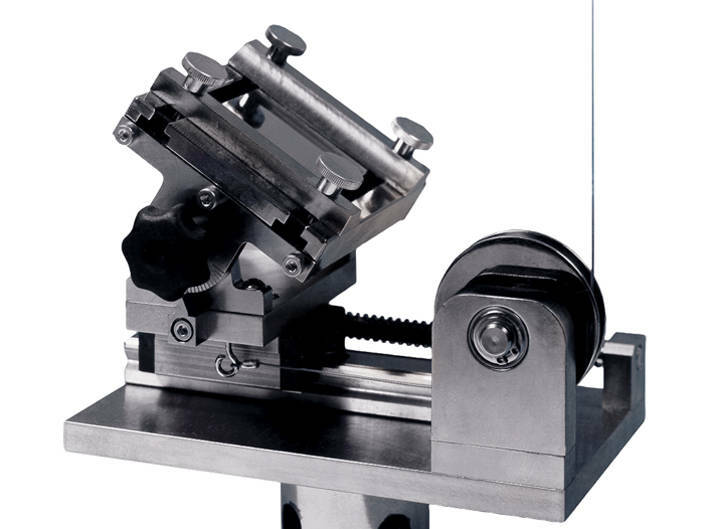 Through the use of a special linkage system, the peel angle is maintained constant during the test.The substrate or component is clamped to the table of the fixture via an "up-down" clamping system. The moving table is then attached to the actuator or crosshead of the test system. The motion of the actuator or crosshead creates movement on the clamp base but only peel forces are sensed and recorded. Peel angles of 30,45,60,90,120,135 and 150 deg.